Helping you to swim a better crawl in the comfort of your own shed. 2. Rotate the screwdriver and as you do so the head of the screw turns. The thread (the spirally bit) of the screw converts the rotational force into an up and down force, and the screw enters the wood and pushes down into it. (Back to the pool…your body gently, powerfully rotates as your shoulders and hips roll. 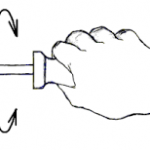 Your loose extended arm acts like the thread of the screw, as it bends at the elbow and sweeps past your body, converting the rotational force into forward movement. Now do it yourself. Three simple steps to improve your front crawl. This entry was posted in Uncategorized on October 19, 2015 by swimwithease.